Large size Christmas Plaid Beveled Market Trays by the 6-Pack have a wide base and measure 7-1/4" x 9-1/4" at the top, 5-1/2" x 7-1/2" at the bottom, and are 3-1/2" deep. 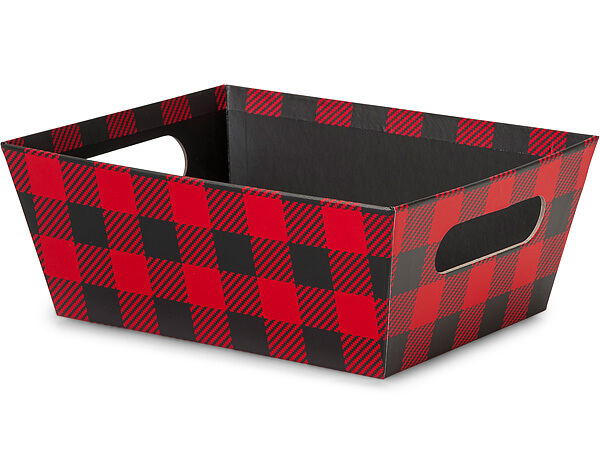 Features a cozy red and black check design! Use with our C18BC Cello Bags, but you'll need to tape down the bottom corners of the cello underneath the tray for a beautiful presentation. For shrink wrapping, use 1216SB for a flat presentation that's even with the tray. Tall presentations use shrink wrap 2030SB.